Cinquecento is billed as a Roman Trattoria – how that is different from any other Italian restaurant escapes me. It is in the two level space that used to be Rocca – there’s a nice ambiance and parking in the back. 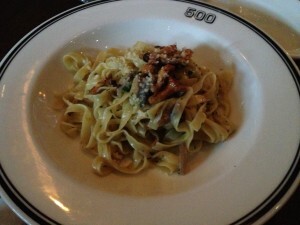 I had the Fettuccine Ai Funghi E Tartufi (fettuccine with chanterelle mushrooms, truffle butter and basil). The homemade pasta itself was very good – toothsome and perfectly al dente, however there were barely any mushrooms and the truffle flavor was non-existent. My dining companion had the Spaghetti al Pomodoro (pasta and tomato sauce), which is literally the most mundane thing on the menu. I didn’t bother to try it, but he said that he enjoyed it. The portions are tiny; they are assuming the pasta is a first course and it will be followed by a meat or fish. However, at $16+, the portions should be a tad more generous. My cocktail, Ananas Salvia, was a delicious blend of rum, lime, pineapple puree and sage. 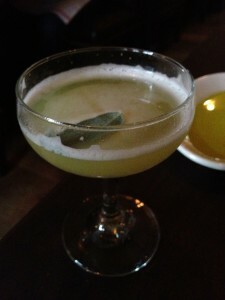 Normally I don’t like herbs in my drinks, but the sage added a nice savory herbaceous note to the drink. The bread basket was slices of a servable Italian loaf with olive oil for dipping. The service was perfunctory. Cinquecento is perfectly fine if you are in the area and in the mood for Italian, but there are much better Italian restaurants out there.